“The recommendation that I make is actually the international community should make [women’s rights] a foreign policy priority. Women’s rights and development have never been a foreign policy priority in most [member] states,” said Dr. Rita Sabat, assistant professor from Notre Dame University in Lebanon. Dr. Sabat said that progress in Lebanon on eliminating violence against women is evident, and she commended the work of civil society and nongovernmental organizations for engaging men, doctors, and social workers on this issue. The interview was conducted by Maureen Quinn, Director of Programs at the International Peace Institute. Maureen Quinn: Today, we are very pleased to have Dr. Rita Sabat, assistant professor from Notre Dame University, Lebanon, here with us today for an interview on the Global Observatory. Dr. Sabat teaches courses on international institutions, gender, nongovernment organizations and development, and was a participant in the international civil society action network first regional forum on women’s rights peace and security for the Middle East, North African, and South Asia last September. So, Rita, thank you very much for doing this interview. The world watched women across the Middle East and North Africa as the leaders and active participants in the Arab awakening or the Arab Spring, as it’s known in 2011. But today, women’s presence and voices have retreated to the background. What has happened? What is limiting women’s participation in these ongoing political transitions? Dr. Rita Sabat: When I think of today, I think of today’s women’s presence and their voices as not having retreated, but as being assaulted, and their continuous attempt in several countries like Egypt to remain in the forefront of this discussion. So, I would like to participate by saying they’re still struggling to have their voices heard and their demands met in these transition countries. Some might even argue they’re not even at transition point yet, and that’s the argument made clear by some of the countries that are still in time of conflict, in time of revolution, because their demands are not being met. There is this fear of a backlash that we have heard about and discussed in the news, and scholars have discussed. So, I think that it’s ongoing, I think that in certain transition countries there is an active presence of women that are trying to ensure that their voices remain heard, that the new governments coming into play, the transition, constitution building, will not result in their complete disappearance from the scene and their rights being rolled back. And I think it’s yet to be seen or foretold, and hopefully will continue to be discussed. MQ: What you think are the most important issues women need to be focusing on at this stage in the political transitions, and what should the next step be? RS: I think the focus should be both at the national, regional, and international level. The demand that it be recognized and supported in the struggles that they have been dealing with for the past two decades. The struggle of gender and equality are directly tied to their security and the security and stability of the states they belong to, and the region that they belong to. I think that is the biggest concern that is not being discussed, especially in the Middle East, not in the Africa region. Where women’s voices on security have never been heard, they never thought it was their position. I mean, usually when we’re talking about political participation, the first comeback is, “Well, is not really a place for women,” you know, the women are too clean to be in the forefront of politics and security. I think that the demand that women’s active participation in political parties, such as their presence in decision-making committees that are not limited just to social affairs or the women committees, but in hard security measures, and that are tied to their development. Their personal development is very important. MQ: We’re here during the Commission on the Status of Women, and in the theme of this year’s commission meeting is the prevention of violence against women. I know you’re involved with this technical task force that’s associated with the Ministry of Social Affairs in Lebanon. 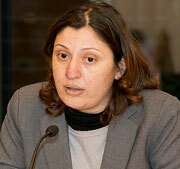 What’s your assessment of the situation regarding gender-based violence in Lebanon and the efforts to prevent it? RS: We’ve been struggling in Lebanon to eliminate gender-based violence since the ‘90s. The progress that has been made by civil society at the normative level can be seen because now it’s discussed. We cannot disregard the progress that has been made. The discussion is there, it’s vibrant, we can hear it on TV, there’s advertisement; we have now listening centers. Not enough, but the progress is there. And the work that civil society is doing, nongovernmental organizations—ABAAD [a resource center in Lebanon for gender equality] has listening centers for engaging men, where a counseling center for men on eliminating violence against women and their work with Ministry of Social Affairs, and the international medical corps has developed a manual for doctors, for social workers, for listening centers on how to actually follow up prevention, prosecution, data-gathering of violence cases that has come in front of them. That’s been great progress in moving the struggle to eliminate violence against women forward. However, the challenge remains. The percentages that have been estimated are much higher than we want them to be, and more visibility with the state security and establishment of a culture of non-violence against women and gender-based violence in general is needed. MQ: As a follow-up, given the large growing numbers of Syrian refugees in Lebanon, certainly an issue of increasing local and international concern. What can you tell us about the influx of refugees and impact on women? RS: The influx of refugees, Syrian refugees, over the past few months has been incredible. It’s been of great concern to Lebanon, who already has a huge number of refugees from the Palestinian community, coupled with refugees that have been coming over from further past years from the Iraqi community, and does not have the capacity to deal and to actually take care and provide the services for refugees. 75% are estimated to be women and children, and are experiencing gender-based violence before they cross the borders, and experiencing new form of gender-based violence from within their communities as well as from the receiving community. All this has the greatest impact on women and children; not only among the refugee community, but in the urban and rural communities that they are now being housed in. Because in Lebanon, we do not have refugee camps for the Syrian refugees. They are living in the rural areas amongst the poor that already are experiencing so much struggle. And this can only increase discrimination, increase inequality, and will only result in increased forms of violence. So, this is of great concern of national level. ABAAD is actually hosting a candlelight vigil on the 15th, to stand in solidarity, as a part of our sisters in humanity, with the Syrian women and children in Lebanon, as they are experiencing a struggle that no human should experience. MQ: Looking broadly at the region, what role do you think the international community can play? Particularly, in the broad issue of women rights peace and security in the Middle East, North Africa, and South Asia? RS: The recommendation that I make is actually the international community should make it a foreign policy priority. Women’s rights and development have never been a foreign policy priority in most states. So, when they meet with their counterpart, bilaterally or multilaterally, it should be on the agenda through 1325 or other mechanism. It should be not only a priority, but it should be a necessity that cannot be negotiated away at the expense of society. At the end of the day, the expense of women means the expense of their counterparts as well, and that’s their women, men and children. So, I think the international community must realize that the women’s right’s agenda; development agenda and security agenda are intricately tied together and cannot be separated for interest or otherwise. MQ: Thank you very much, Rita, thank you for taking the time to join us on the Global Observatory. RS: Thank you very much for having me. Maureen Quinn is Senior Director of Programs at the International Peace Institute.